I’m having a midweek ‘weekend’. I worked over the weekend, got two jobs in the post yesterday, expect more work at the end of the week, but was free to indulge a passion for art and food today by heading into central London this morning. 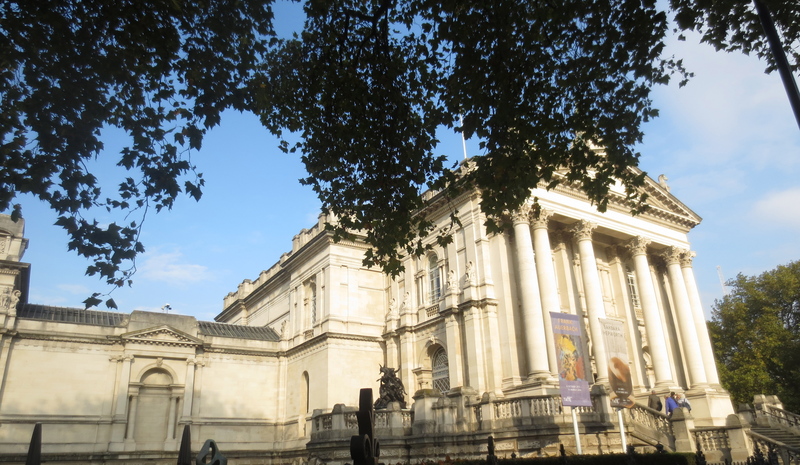 I’m a Friend of Tate and with two big exhibitions at Tate Britain I wanted to see, it seemed the perfect place to go. So important is my morning coffee to me that I actually googled ‘where can I find a good coffee in Pimlico?’ but then decided I should have coffee in the Members’ Room when I arrived soon after 10 a.m. It is, unsurprisingly, a civilised place for a quiet morning coffee. I had a good pot of afternoon tea there a while back. Sadly the flat white I ordered today didn’t match the tea experience. 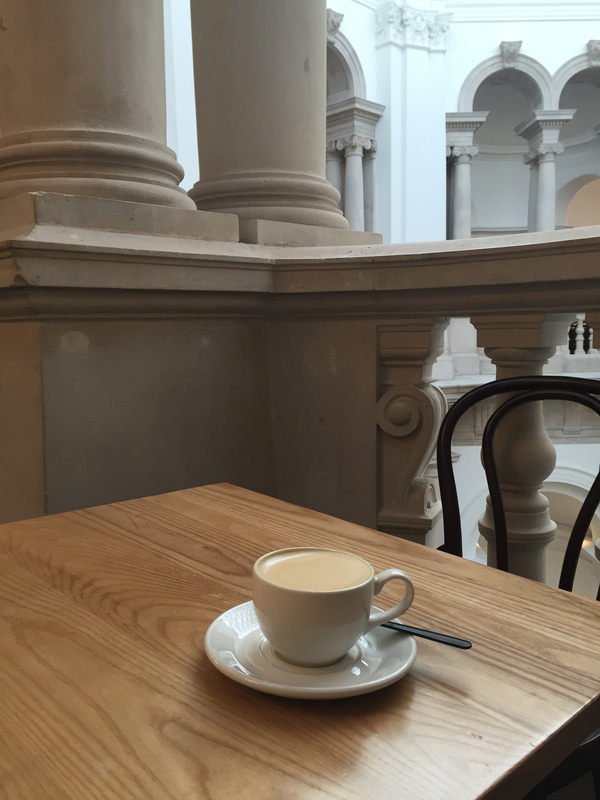 It was rather a miserable coffee more akin to a milky latte than a flat white. Ah well … on with the art, I thought. I went first into the Frank Auerbach exhibition. I didn’t know his work but had read an enthusiastic review online in the Guardian. I often go on Curators’ Tours of exhibitions at Tate and felt a knowledgeable enthusiast would have been useful today. Auerbach’s work isn’t easy to connect to immediately and I was pleased I’d read Ben Luke in the Standard saying ‘it’s taken me a long time to love the work of Frank Auberbach’. Born in Berlin in 1931, and Jewish, his parents sent him to England in 1939 to escape the Nazis; tragically they died in a concentration camp. Auerbach became a naturalised British citizen in 1947. Wrested from his family and home so early in life, it’s interesting that he’s spent decades working and reworking the same subjects: the same people, the same areas of London, as if making them his own. The paint is applied in such thick layers – sometimes over months or even years – that it’s extraordinary to see it; it’s almost sculptural; faces become almost three dimensional. It was the portraits and people that really drew my attention. I moved in close and then way out again, in awe of how the thick layers realigned themselves into faces or prone bodies. The more I looked, the clearer they became and I found myself drawn in, and thus this became the beginning of my liking Frank Auerbach. Downstairs, I visited the ‘Barbara Hepworth: Sculpture for a Modern World’. I did actually go to a Curator’s Talk a while ago though missed seeing the actual exhibition. It wasn’t the most inspiring talk I’d been to there (and I go quite regularly) and nor was the exhibition very inspiring. In the first room there are so many other contemporary ‘influences’ that it was hard to find a Hepworth. In another room Ben Nicholson – Hepworth’s second husband – dominated. It pressed my feminist button: Hepworth stands on her own as one of our greatest artists and doesn’t need to be shown in relation to Nicholson. Many of the sculptures are housed in glass boxes. Of course, one isn’t supposed to touch them but sculpture is so much about touch that the barrier of a glass box is off-putting. It’s the final two rooms where large wooden and bronze statues are shown that the exhibition comes into its own. These were the ones I loved. But I couldn’t help comparing it with the experience of visiting the Barbara Hepworth Museum & Sculpture Garden in St Ives a few years ago. My daughter and I arrived early; we had the garden almost to ourselves, a garden filled with huge, magnificent and quite wonderful sculptures. One of the museum’s security people came up to us and said, You are allowed to touch them; to walk through the large sculptures. So we did. And that’s really what you have to do with sculpture: touch it, feel it, experience it. Well, after all that art it was time to turn my attention to food. Food is never far from the Single Gourmet Traveller’s mind. 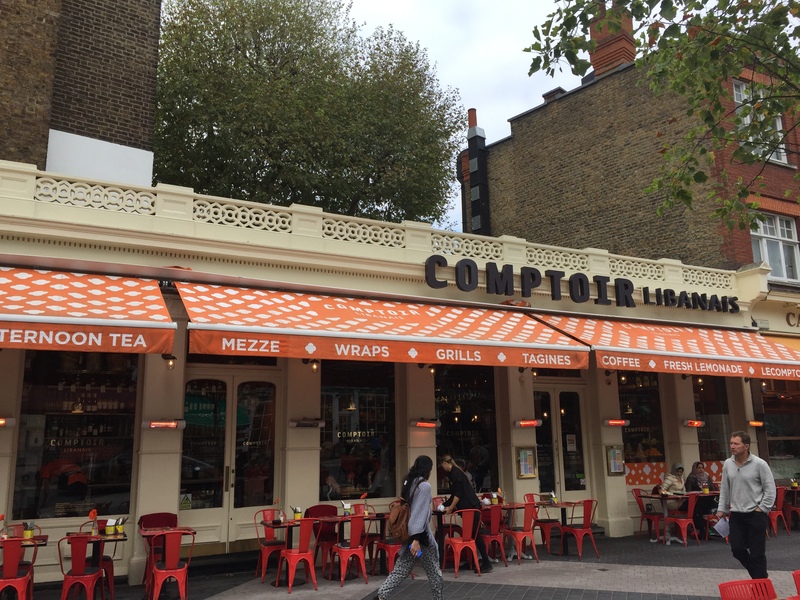 I searched for a few places nearby online but found nothing that appealed and by the time I’d made my way almost to Victoria station, I decided to head to South Kensington and go to Comptoir Libanais, which I’ve been wanting to visit for a while. I love Middle Eastern food almost as much as I love Italian food. This chain of Lebanese restaurants has been around for a while but it was my first visit today. I arrived quite early and was given a table which gave me a good view across the restaurant and to the bar area. I was pleased to see that I could have a mixed mezze plate for one – so often these mixed plates are for two – so that was my choice for lunch. And there are few lunches more perfect than a plate of mezze: full of taste but fairly light. 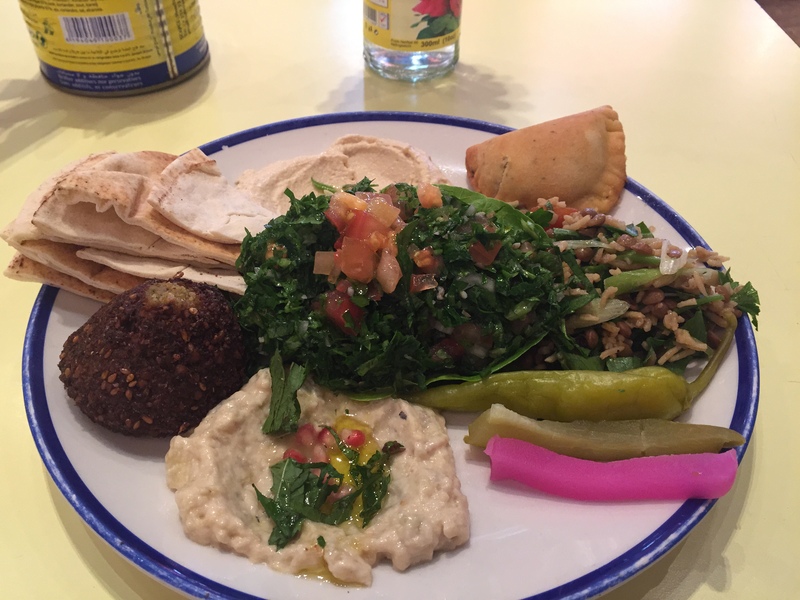 It was a good selection: baba ganoush, hummus, tabbouleh, falafel, lentil salad, cheese sambousek, pickles and pitta bread. All for £8.95. It was good – though not exceptional. The baba ganoush was nicely smokey; the hummus good and smooth; the tabbouleh correctly made with lots of parsley and only a little grain; and a nice falafel. However, the pastry of the cheese parcel was a bit thick and soggy rather than dry and crisp; the pitta too chewy. I’m being blogger fussy here, of course; I did enjoy it; liked the buzzing atmosphere. 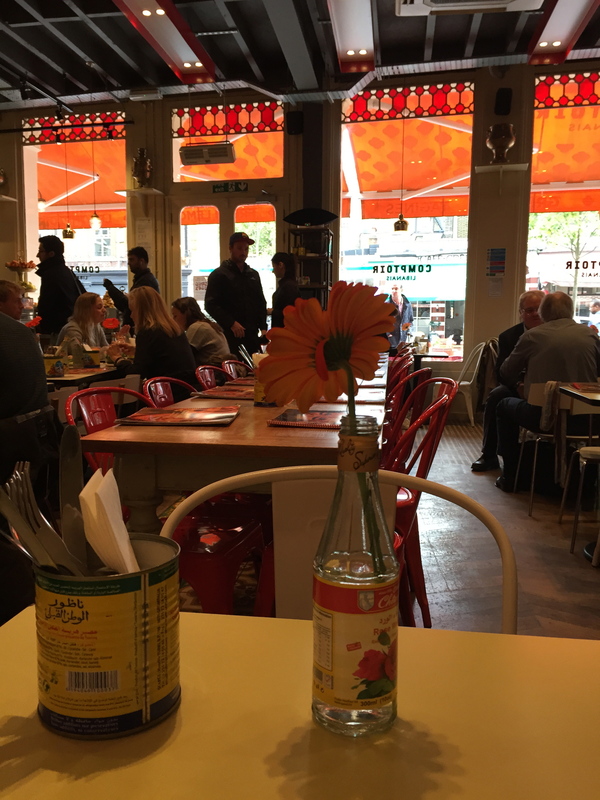 It was a good lunch place but the food not as good as I’ve enjoyed at other Lebanese places, like Yalla Yalla, and Maroush in Edgware Road. I had a mint tea to finish; I was in no hurry. Then I headed back towards South Kensington station – but with the intention of having some gelato for my ‘dessert’. 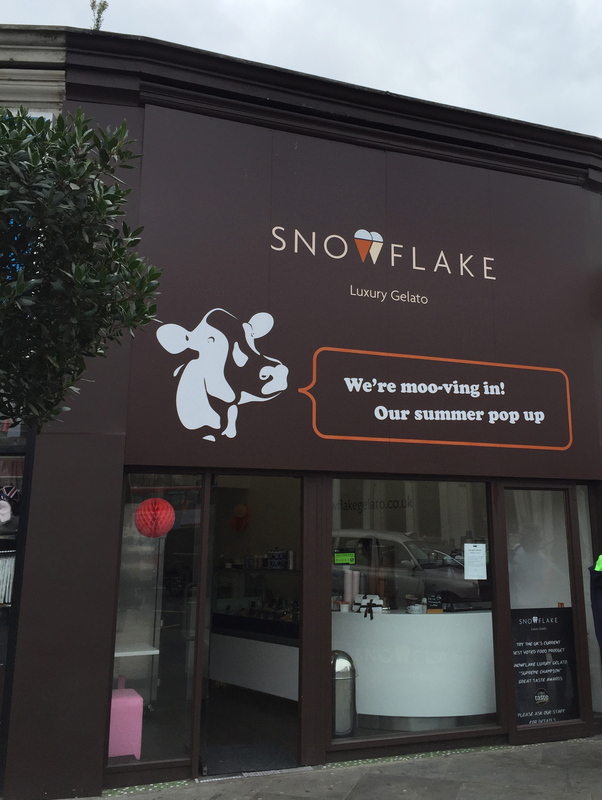 I’d seen Snowflake – Luxury Gelato earlier and had heard good things about it. 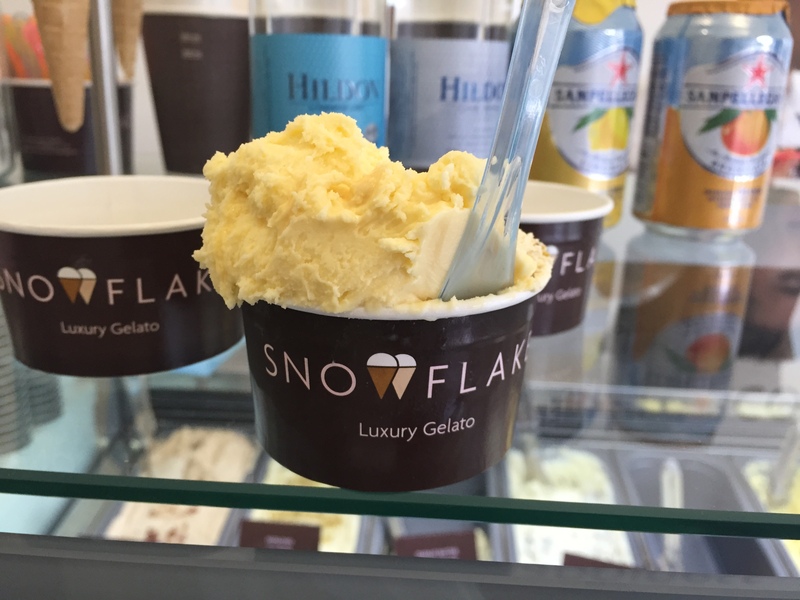 Snowflake won 18 Great Taste Awards last year and has had much praise in the media. Would it live up to all the hype? Yes – it did! Wow. Fabulous ice cream. The guy serving was friendly and as we got talking he offered me tastes – even though I’d already chosen my pistachio and some sea salt caramel – two flavours in small tub for £3.40. The dark chocolate he gave me to taste was amazing. I must have that next time. There was a wonderful hazelnut – the nuts from Piemonte; lemon sorbet made with lemons from Amalfi; the pistachios came from Sicily. The day had moved from a bad coffee in the morning to a wonderful gelato at lunchtime! It’s so nice when things move in the right direction. And it had also been a great day – well, more like half a day – out.